The adidas 3 Stripe Baseball Cap offers added style and sport substance no matter when you intend to wear. This hat made with climalite fabric helps keep you dry by drawing sweat away from your brow An adjustable strap-back closure and UV 50+ protection. 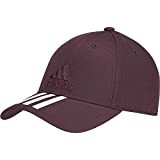 Medium pre-curved brim with embroidered 3-Stripes, Adjustable back strap with buckle closure, Six-panel construction with embroidered vent holes and added Embroidered adidas brandmark on front. This entry was posted in Baseball and tagged 3Stripes, Adidas, Casquette, Classic, SixPanel by FPSports. Bookmark the permalink.